I am going to perform the maibayashi from the Noh “Toru” on August 17th. I will be glad to see you there! 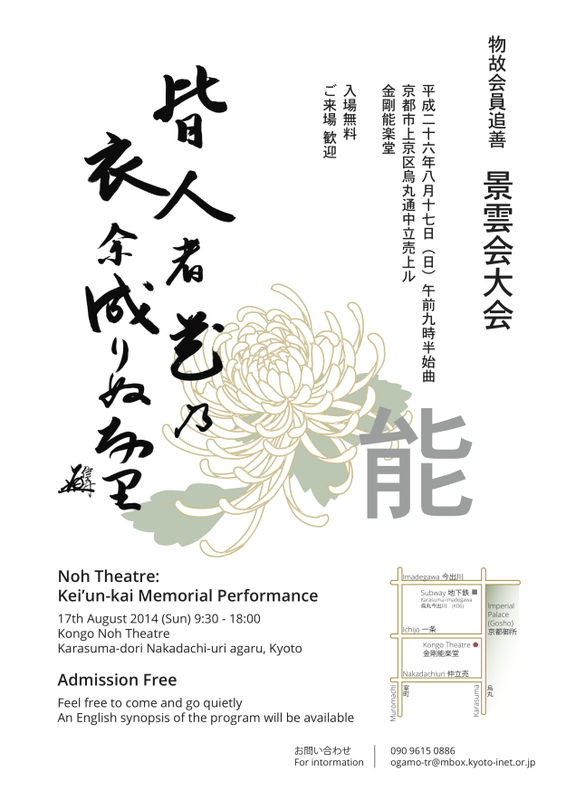 On 17 August 2014 from 9:30am the Kei’un-kai (the group Udaka Michishige’s students, incuding the International Noh Institute) will hold a Memorial Performance at the Kongō Noh Theatre in Kyoto. The performance will begin with two bangai shimai or special feature dance excerpts by masters Taneda Michikazu (Eguchi) and Udaka Michishige (Fujitō), followed by a recitation of an excerpt from the Noh Seigan-ji by Udaka Michishige’s sons, Tatsushige and Norishige. Student performances will begin at 9:50 and will feature a number of shimai, maibayashi and two full Noh plays (from 13:00 Atsumori, Shite: Nagao Atsushi; from 17:00 Funa Benkei, Shite: Higaki Takafumi). ADMISSION FREE: feel free to come and go quietly. An English synopsis of the program will be available. Download here the full program (Japanese only).